KINGSPORT – Tennessee Democratic U.S. Senate nominee Phil Bredesen – amid a drop in one poll – on Thursday lamented the effect of so-called “dark money” political advocacy groups pummeling him with negative ads. He talked about it during a “Friendraiser” event at the Kingsport Farmers Market, where he served chili to supporters and tried to get them fired up about his contentious race with Republican Marsha Blackburn to fill the seat held by retiring Republican Bob Corker. Filings with the Federal Election Commission show those advocacy groups favoring Blackburn’s campaign have generated more than $14 million, while his supporting advocacy group, Majority Forward, has generated more than $6 million. Both sides, including both campaigns, are running negative ads. After a recent CBS poll showed Blackburn up eight points, Blackburn took a nearly three-point lead, according to Real Clear Politics. Kingsport Alderman Jennifer Adler spoke favorably about Bredesen at the event. “Governor Bredesen has been a steady and constant presence in Tennessee for decades now. 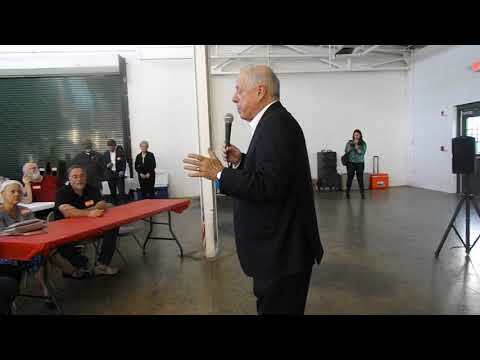 … He led this state with a steady hand through good times and bad,” she told Bredesen supporters at the event. What did you think about a Project Veritas video critical of your decision to say you would have voted for Supreme Court Judge Brett Kavanaugh’s nomination? “It wasn’t our campaign,” Bredesen responded. According to Tennessee Victory 2018, the coordinated campaign of the Tennessee Democratic Party, a fake volunteer made the video. Politico is reporting you are losing campaign volunteers because of your Kavanaugh decision. Is that true? What’s this about former New York Mayor Michael Bloomberg doing a fundraiser for you? “It’s done. … He offered to do that and I accepted. … I got to know him slightly when I was governor,” Bredesen responded. Is the endorsement from entertainer Taylor Swift helping you?